Wyeth is embarking on yet another national advertising campaign for its SMA formula. This must be costing millions of pounds – a bill ultimately paid by those who buy formula. The subvert below made me think about how much mark up there is on formula. Companies won’t reveal the breakdown of their costs, so the calculation below is based on speculation. How much for farmers and processing? A 250 ml bottle of Wyeth’s new SMA ready-to-feed formula costs 79 pence (updated to price in Boots on 24 August 2012). The dairy farmer will have received less than 7 pence for the milk (according to Farmers for Action farmers currently receive 27 pence per litre for milk from processors – click here). 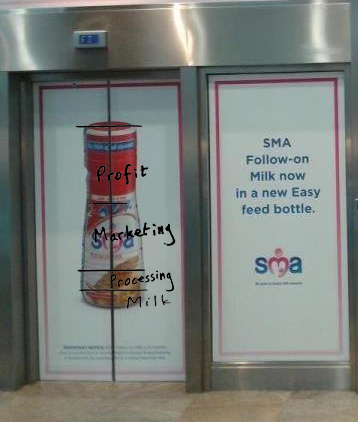 Changing the fat content, pasteurising, packaging and distributing whole milk costs about 3 pence for 250 ml (Farmers for Action figures suggest 27 pence processing costs for 2.3 litres). Let’s speculate and say that changing the protein content, adding vitamins, extracts from algae (LCPs) and other additives triples the processing costs of formula milk compared with whole milk. That would be 9 pence for 250 ml. This would make the total cost of the milk and production 16 pence per 250 ml. The remaining 63 pence of the 79 pence selling price will be split between company and retailer profit and the costs of marketing, including advertising campaigns, baby clubs, “carelines”, events for health workers, and other promotion. Based on this comment, if we redo the above calculation saying the processing cost of infant formula is ten times that of normal milk (which is unlikely), that makes the processing cost 30 pence for 250 ml and total cost of milk and processing 37 pence for 250 ml. The balance on the 79 pence container will now be 42 pence for promotion and profit. On these figures, the proportion of the selling price of formula going towards promotion and profit is between 53% and 80%. Feeding a child on SMA ready-to-feed infant formula and observing the instruction to discard milk not used within 2 hours, will use 1,398 bottles over the first year if following the table on a 250 ml bottle. At 79 pence per bottle (the price in Boots on 24 August 2012), this will cost £1,104.42, not including the teats. Of this, parents are paying between about £585 and £884 towards company promotion costs and profit, based on the above figures. Powdered formula is cheaper. Following the Aptamil feeding table and current price of £9.49 per 900g tin (Tesco on 24 August 2012), the total amount of milk powder required would cost £436.54 (not allowing for throwing away unused formula and not including bottles, sterilising etc). Applying the above percentages, would mean parents are contributing between £231 and £349 towards company promotion costs and profit. Although marketing figures are hard to come by, it is known that Wyeth awarded a contract for £2 million to a PR agency in 2008 for targeting pregnant women, new mothers and health workers. In 2012 it must surely have already spent far more than this, having run two national billboard advertising and mass media campaigns by the end of July and planned the SMA Baby Know How roadshow to launch its new formula packaging (which was cancelled following protests). Wyeth already has a criminal conviction for breaking advertising regulations and complaints have been upheld by the Advertising Standards Authority. Its Self-serving Marketing Activities benefit no-one and inflate prices through the costs of these and by positioning the product with misleading, idealising claims. All formulas on the UK market have to comply with composition regulations and optional ingredients (which have been added to most formulas) have no proven benefit, so there is no health advantage from buying more expensive formula. If you can help improve this calculation, please contact Baby Milk Action. The spreadsheet with the feeding table data and calculations is attached. Click here to download.